﻿Meet Becca, of English-Caribbean heritage, from Bridport – Where are you really from? Growing up as a person of mixed heritage in Dorset has had its challenges. I’ve been living in Bridport for pretty much all of my life, after my mum made the decision to move the two of us from London to the South West in ’96. Despite the fact that my mother, a Caucasian-English woman, raised me without my biological father (a British-Caribbean man) and later went on to have children with two Caucasian men, I grew up never feeling as if I were different from the rest of my family. However, outside of the family home, I soon became familiar with a sense of alienation after various experiences of being singled out and discriminated towards because of my race. It was a harsh reality check, and insight into the minds of many people around me. Some of my first memories of racism date back to primary school, when I was aged 6 or 7. In one scenario, I got into an argument with a boy who retaliated by calling me a n****r – I was clueless as to what this word actually meant! I went home that day and asked my mum, who informed me it was a derogatory word for people of colour. I was pretty dumbfounded; a bubble of childhood innocence burst that day and I became painfully aware of the fact that I was never really viewed as equal to my white peers. I don’t think it was long after this that I really started to pine for the relationship I never had with my real dad. Missing the man whom I inherited my skin colour from, the key thing that I was repeatedly being singled out for, left me feeling all the more displaced. My dad and I eventaully met when I was 14, and we have a great relationship now. However I desperately needed that person to identify with during the times of hardship. I wasn’t left to deal with any of this alone, and I definitely had a strong support system – I have memories of a friend once shouting, ‘if she’s a n****r, then I’m a n****r’ to a child who’d randomly hurled the ‘N word’ at me in the playground. She will always hold a special spot in my heart for that – needless to say we’ve been close friends ever since. 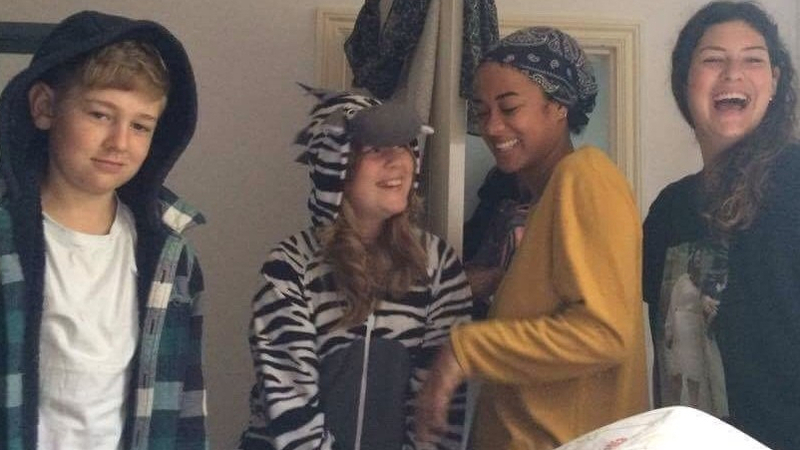 I’m hugely grateful for the friends and family who were there to console me during these times, and not to take away from any support they gave me, but not having an identifiable person of colour in my life, someone who could really relate to the struggles of facing racism, definitely added extra weight to already heavy situations. In 2016 I moved from Bridport to Amsterdam in the Netherlands. I returned in September 2018 to have my now 4 month-old daughter, and aside from occasional uncomfortable moments where I feel that someone has been holding a stare a little too long, there’s been no recent experience of facing racism/micro-aggressions whilst living in Dorset. But I’m not ignorant to the fact that just because the discrimination I faced as a child living in Dorset isn’t something that I’ve yet had to deal with living here as a young adult, doesn’t mean that racism is no longer an issue in this county or even the country. I hope that my daughter won’t have a childhood marred by coming up against the same trouble I did as a brown girl growing up in Bridport. I know that the people who I had the misfortunate of encountering do not account for a large majority of those living in the South West, but I do feel that there is still a long way to go in the fight against racism and in rural England especially.